Jon Snow, Sansa, and Ser Davos begin searching for allies to retake Winterfell from the Boltons. 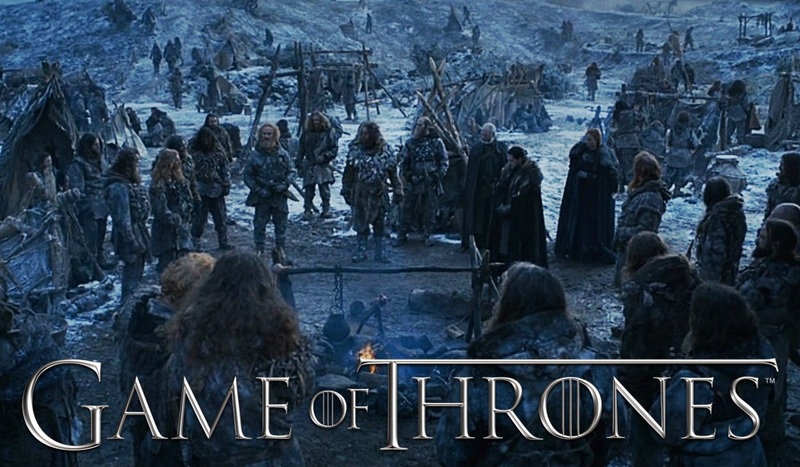 First, they secure the allegiance of the Wildlings, who are still indebted to Jon for saving them at Hardhome, and are aware the Boltons will wipe them out if they do nothing. Dim Dalba: We said we’d fight with you, King Crow, when the time comes and we meant it, but this isn’t what we agreed to. These aren’t white walkers. This isn’t an army of the dead. This isn’t our fight. Tormund: If it weren’t for him, none of us would be here. All of you would be meat in the Night King’s army. And I’d be a pile of charred bones just like Mance. Dim Dalba: Remember Mance’s camp? It stretched all the way to the horizon. And look at us now. Look what’s left of us. And if we lose this, we’re gone. Dozens of tribes, hundreds of generations. Be like we were never there at all. We’ll be the last of the free folk. Jon: That’s what’ll happen to you if we lose. The Boltons, the Karstarks, the Umbers, they know you’re here. They know that more than half of you are women and children. After they finish with me, they’ll come for you. You’re right. This isn’t your fight. You shouldn’t have to come to Winterfell with me. I shouldn’t be asking you. It’s not the deal we made. I need you with me if we’re going to beat them, and we need to beat them if you’re going to survive. Tormund: The crows killed him because he spoke for the free folk when no other southerners would. He died for us. If we are not willing to do the same for him, we’re cowards. And if that’s what we are, we deserve to be the last of the free folk.